Happy Christmas Eve Everyone!! 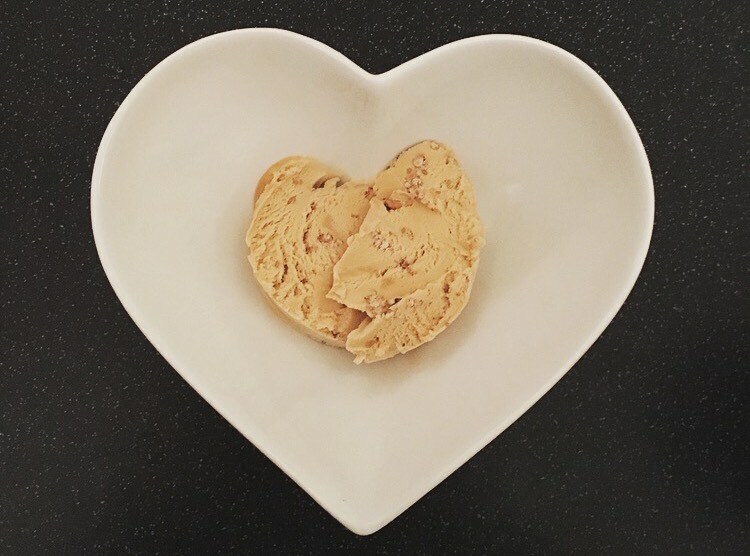 What better way to mark the day before christmas than with Sainsbury’s Gingerbread Ice Cream. I have been like a woman possessed searching for this tub; because frankly Gingerbread Ice Cream is an ice cream I want to get on board with. I have never really seen Gingerbread as solely a festive foodie flavour and my love for Jamaican Ginger Cake is something I feed throughout the year. Now if Sainsbury’s can morph that into an ice cream, just like Mr Kipling did with their Viennese Whirls, well we will have one happy Nibs ‘n’ Scribs I can assure you of that! For once it did not take me umpteen supermarket visits to find this tub of Gingerbread and I was eager to get stuck in right away. Well not in the aisles of Sainsbury’s however I did contemplate that for a second. Just like their Salted Peanut and Caramel Tub I did not have to wait 10 minutes for it to defrost before I could scoop some out. I’m not one for perfect quenelles of ice cream, as long as there is some in my bowl and I didn’t have to wait a decade for it, I am a happy bunny. 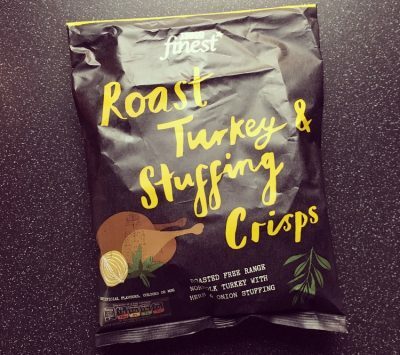 Sainsbury’s promises it to be packed full of ginger biscuit crumble & rich toffee sauce and by smell alone we are off to a gingerbread winner. The toffee sauce swirl was pretty camouflaged against the gingerbread ice cream and particularly in comparison to the gingerbread crumble pieces. For a basic Supermarket range the ice cream is a good quality number, it’s spiced, warming and a gingerbread taste explosion. The gingerbread crumble pieces are pretty tiny, but don’t let that fool you they do pack a crunchy punch and break up the smooth ice cream rather well. The toffee sauce is less to be desired. I’m not sure what it brings to the table because it certainly isn’t a lot of flavour or an addition that can be recognised within the gingerbread. That aside this tub does exactly what it sets out to – it gives us gingerbread yumminess! 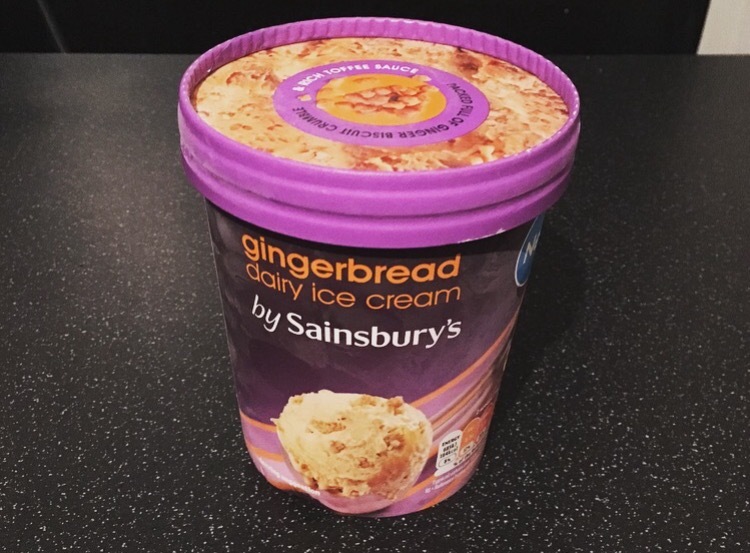 Like the Jamaican Ginger Cake, this Sainsbury’s Gingerbread Ice Cream is one that you have to have a hankering for and not, in my opinion an everyday go to ice cream. It doesn’t say it is a limited edition so I do wonder if this tub is to stay, but just in case gingerbread lovers you best hop-foot it down to your local Sainsbury’s.